Three of the Minnesota Twins four full-season affiliates were in action on Tuesday night and there were stories in each. In Rochester there were some interesting pitching moves, it was a nail-biter in Fort Myers, and the Cedar Rapids offense put on a display on the road. After checking out how all of your favorite prospects fared on Tuesday night, start the discussion with any comments and questions in the forum! The story in this one was the starting pitchers for the Red Wings, though not because of their seven innings of solid performance. It’s the fact that two starters appeared in the game, with the first of them on a quick hook after just 24 pitches. That first starter was lefty Adalberto Mejia. He allowed one hit (including a throwing error on himself) and one walk in the first before escaping with no damage and had a one-two-three inning in the second when his day was cut short. It was then Fernando Romero who came on for his 2018 debut and went the next five innings. Romero was scheduled to make the start on Wednesday, so let the speculation begin. Romero left the game with his team down 2-1, but otherwise it was a solid first outing of the year. Both runs against were unearned thanks to an error in the top of the seventh and in all he surrendered five hits and two walks, while striking out three. Of his 72 pitches, 45 went for strikes (62.5%). Rochester tied the game at two in the bottom of the seventh on a Gregorio Petit double to score Nick Buss, who had himself doubled to lead off the frame. Alan Busenitz then came on for the eighth inning, but two doubles put Syracuse out front 3-2 and they’d close it down from there. Nick Anderson worked a scoreless ninth in his AAA debut, recording all three outs via K’s, to give the Red Wings a chance in the bottom half, but a leadoff walk from Buss was followed by three consecutive outs to end the game. Zack Granite (2-5), Taylor Featherstone (2-4, 2B), Buss (2-3, R, 2B, BB), and Petit (2-4, R, 2B, RBI) accounted for eight of Rochester’s nine hits on the game. After losing their season opening five-game series with the Birmingham Barons 3-2, The Lookouts got an off day to travel to Pensacola, Florida. They take on the Blue Wahoos at 6:35 PM CST Wednesday night, with right-hander Zack Littell on the mound looking to get them to .500 early in the season and pick up his first win after tallying 19 a year ago. The Miracle got into a pitching duel with the Fire Frogs on Tuesday night after a brief weather delay at the start of the game, as the teams combined for just 13 hits and went 1-14 with runners in scoring position. Sean Poppen got the start for Fort Myers and went the first four innings. He allowed only three hits and struck out seven on just 57 pitches (43 for strikes) in an impressive performance. He struck out two in each of the second and third innings, and all three in the fourth to finish strong. He was relieved by Colton Davis who was stuck with the loss thanks to an error in the fifth inning that led to the only run of the game. Davis went three innings in total, allowing two hits and striking out four. Andrew Vasquez finished the final two innings for the Miracle, giving up one hit and striking out two. The Fort Myers offense had runners in scoring position in each of the game's first four innings but were unable to push a run across, then were shut down until the ninth. Jimmy Kerrigan led off the final frame with a single and was bunted into scoring position, but would end the game stranded on third. The Miracle offense got two hits from designated hitter Jared Foster, right fielder Jaylin Davis notched his second double of the season, and second baseman Nelson Molina notched his first double of the year in the loss. Cedar Rapids jumped out to an early lead in the second inning when Andrew Bechtold led off with a single that was followed by doubles from Ben Rortvedt and Trey Cabbage to score two. Mark Contreras tacked on a third run with an RBI single later in the inning. The score remained 3-0 until the bottom of the fifth, when the Chiefs finally got to Kernels starter Tyler Watson. Before a triple to lead off the inning, Watson had retired 11 in a row after allowing a two-out single in the first. That runner scored on a wild-pitch to make it 3-1. The Kernels responded in the sixth inning, putting up another crooked number to take control. Rortvedt led off by drawing a walk, and another double from Cabbage put runners on second and third. David Banuelos loaded the bases with another walk and Cedar Rapids scored the first run of the inning on a double-play ball. Royce Lewis drove in the second with a two-out single, and Alex Kirilloff the final two with a double to put Cedar Rapids up 7-1. Watson came on for the 6th inning but after allowing a single, was removed with one out in favor of Moises Gomez. In total Watson went 5.1 innings, allowing one earned run on three hits, while striking out one to pick up his first win of the season. Gomez finished the sixth but ran into trouble in the seventh. The leadoff man tripled and was followed by a double to score one, and two hitters later a single to put runners on the corners brought on fireman Jovani Moran. The left-hander picked up a K and a groundout to escape this jam, but like Gomez would find trouble coming back out for the eighth. Two walks and a two-out single would give Peoria their third run of the game before Moran got out of the inning. Kirilloff added an insurance run in the eighth with an RBI single that made it it 8-3, and Cedar Rapids almost needed it. Jose Martinez came on to finish the game but was greeted by consecutive singles and throwing error to score a run and a wild-pitch to score another. After issuing a walk he picked up the first two outs on consecutive K’s before surrendering an RBI double to make the final of 8-6. He ended the game with his third strikeout. Rortvedt led the Kernels with a 4-4 day at the plate, including two doubles, a walk, and two runs scored. Cabbage, Contreras, Jose Miranda, and Kirilloff each added two hits to the 15-hit effort and they went 5-16 with runners in scoring position. Please feel free to ask questions and discuss Tuesday’s games! So, Mejia is removed after two innings, ... to make room for Romero to throw five? Spring weather anomalies driving pitching decisions? Getting Mejia ready to pitch Friday, I would guess? I'm guessing we all now know who just might start for the Twins on Friday night. Of course, weather may also factor into that. They aren't going to want to activate Hughes from his rehab stint if he's not going to pitch Friday and they can go back to their rotation on Saturday. So, they may have Mejia up here for just in case. My crystal ball says:Twins would be lucky to get in ONE game this weekend, given the weather. Break out the double-headers in mid-summer. I've got my snowpants and Twins bomber hat ready for Saturday's game, bring it on. The 'Top Prospect Summary' is a nice addition to the minor league report. I'm curious, when Chattanooga travels to Pensacola, is it by plane or bus?? Do the minor league players ever get to travel by plane? ?Or is it all bus travel? Big day for Rortvedt.Interestingly Banuelos hit DH yesterday too.I am sure this spurred Ron to give Toby some nasty feedback after the game. I really like the top prospect summary at the end.Thanks for doing that.What the Romero/Mejia juggling did for me was emphasize why it should be Romero and not Mejia coming to the Twins, but I am sure that will not be the case. 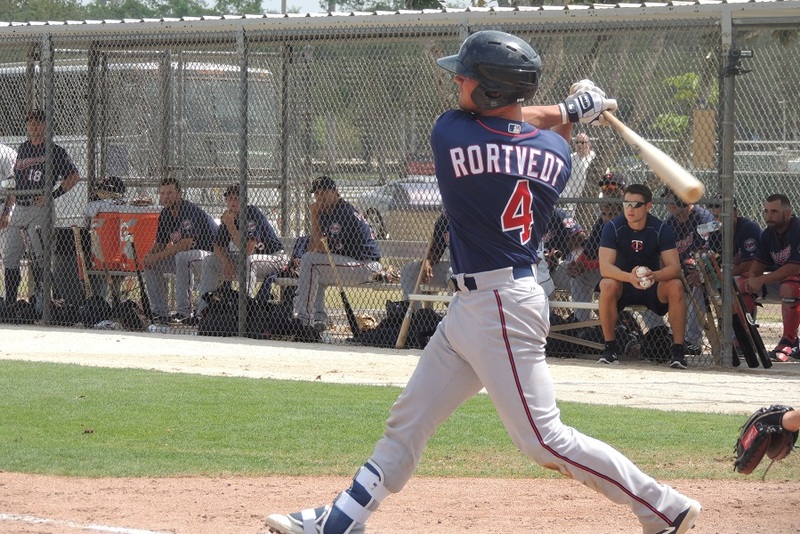 What a fantastic start for Rortvedt.Although he isn't going to hit .400, it would be great if he keeps this up for a month before moving up to Fort Myers.The Twins need a stud catcher knocking on the door to Target Field. Shouldn't Watson be on your Top Prospect Summary?Seems he would make the top 20 by most standards. Van Stensel tends to moan a lot about travel, weather, inadequate pay.I wonder if he has considered a career change?I understand the pay isn't sufficient at this time of their lives, kind of like paying to go to college in order to eventually procure a better job. But last year he pitched an average one inning every 3 days.I'd say $1,900 is doable.This year he has pitched 1.1 inning and is complaining a lot.Remember--every Kernels player is given a free place to stay, most with many amenities including cable, A/C, cable, and for many, even a car to use for free. Another feature that would be great would be a weekly (or even monthly) cumulative statistical summary of these prospects, along with others who have made themselves interesting since the prospect list was published. I know all of this takes a lot of time, but it would be another excellent addition. Check out the Adopt A Prospect page. There you will find much of what you're looking for on each prospect throughout the season. I haven't seen him on any Top 20s. He's in some Top 30s. Not ever Miracle player or E-Twins player or Lookouts player or Red Wings player does. In fact, most don't. The Kernels have a great set up for the players. Much better than when they were in Beloit. But that's unusual. Every month, we present the Hitter, Starting Pitcher and Relief PItcher of the month awards for Twins Daily. We mention the top 5 or 6 players, prospects or not, and we generally will include several Honorable Mentions. Maybe we could do an update on the Top 20s within that. We'll see. Nice AAA debut for Romero. Keep in mind too that 2 of the 5 hits given up by Romero were infield hits. I think as time goes on he’ll look even more impressive. It has to be tough for all of the Rochester pitchers...and those from other northern IL teams.They broke camp in Florida, what 8-10 days ago?And hadn't played an inning until last night for Mejia and Romero.Expect we are gonna see lots of so-so first couple starts for many of these guys.And Romero's outing was still a very good one. I suppose it bears mentioning that Rortvedt is my Adopt-A-Prospect, and you can follow his progress this season here.